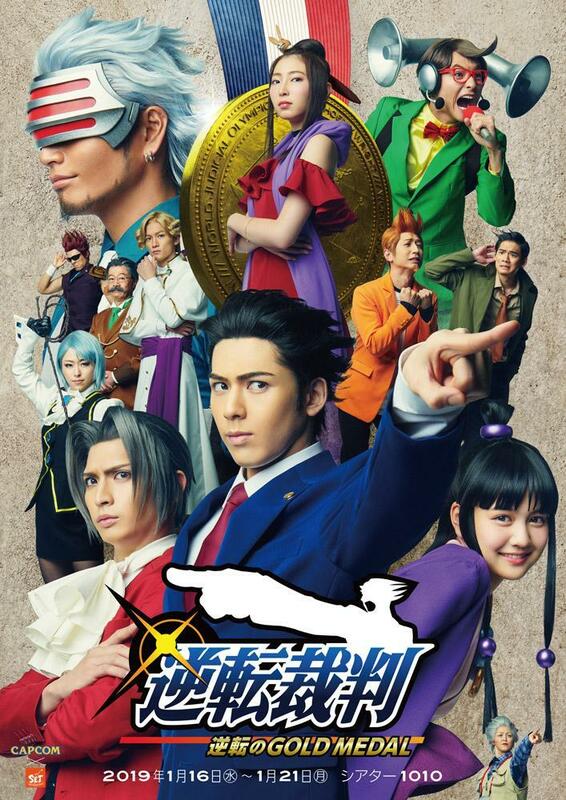 Capcom's popular Ace Attorney series has seen many forms with video games, anime, and live-action films under its belt, and now it will be getting a new stage play running for a short time in Japan next year. Super Eccentric Theater in Japan is producing the new play, titled Ace Attorney -Turnabout GOLD MEDAL-, in January next year, and you can check out the first colorful visual from the play's official website below. Running for nine performances from January 16 to January 21 at Theater 1010 in Japan, the play will be directed by Yo Hosoka with Eisaku Sato providing the script. The play will also feature the stage play debut of Godot, and a brand new character designed by Ace Attorney's original character designer Tatsuro Iwamoto. The last play based on the series debuted back in 2016, so this will be a welcome sight for fans in Japan. Godot the prosecutor recently made his debut in the anime version of the series as well. Debuting in the second season of the series, he's ably played by Hiroaki Hirata. Shu Takumi, director of the original game series, is collaborating with A-1 Pictures for the second season's production much like he did for the first. Ayumu Watanabe returns to direct the series, Atsuhiro Tomioka returns to write for the season, Kaoru Wada returns as composer, Yukiko Imai serves as assistant director, and Keiko Ota returns for character designer and chief animation director duties. "Adapted from the popular video game franchise, Ace Attorney follows rookie lawyer Naruhodo Ryuuichi (Phoenix Wright) and his assistant Mayoi (Maya) as he defends his clients in a court of law. With limited evidence and logic as his only weapon, can Naruhodo turn the case around when all the odds are stacked against him?" Ace Attorney is a series of visual novel courtroom games from developer Capcom. First released in 2001 for the Nintendo Game Boy Advance, the series has since spawned many sequels, remasters, spin-offs, anime, and live-action adaptations. The series follows the rookie defense attorney Phoenix Wright who always does his best to clear his client's names, and have them declared innocent after every one of the game series' famous courtroom trials.